Our students are only a few days into their summer vacations, but I’m somewhat tempted to call a few 1st, 2nd and 3rd graders back for a special session. These young fans of Bink & Gollie have to see the second installment of this wonderful new series of early readers: Bink & Gollie: Two For One. The two friends are opposites in almost every way. Gollie is tall. Bink is short. Gollie is hesitant. Bink is bold. They are both such likable characters that when I closed the book, I wondered what each girl would be like when they reached high school. If nothing else, I was certain they would remain best friends. The illustrations by Tony Fucile are cheerful and touching. The last two page spread of the state fair made my throat catch a bit. It felt fleeting – like summer, childhood and state fairs. Since it’s Halloween, I’m writing about a book that can truly be considered a “treat.” Like most children’s librarians, I consider anything written by Kate DiCamillo to be an automatic purchase and so when I heard about this new easy reader book, I ordered it sight unseen. I knew by the cover that I was going to love it. As I expected, it’s so wonderful that I wish I could put it in every child’s (under 10) trick-or-treat bag tonight. Bink and Gollie are friends, but like Rat and Mole (The Wind in the Willows) or Toot and Puddle, they are opposites. Gollie is tall and logical. Bink is small and whimsical. The illustrations by Tony Fucile capture their personalities with energy and humor. “It’s a sock bonanza!” said Bink. “I’ll take this pair,” said Bink. “I can’t wait to put them on,” said Bink. “I love socks,” said Bink. “Some socks are more lovable than others,” said Gollie. The Peanuts gang came also to mind when reading this book. In three connected stories, there are no adults present. At first I looked for one of the girl’s parents, but then I loved the fact that I had to suspend my own logical/Gollie tendencies and just go along for the ride. As Gollie says, some socks are more lovable than others, and the same is true for books. Bink & Gollie is more lovable than many of them. I’m reading Frances O’Roark Dowell’s novel, Shooting the Moon, in preparation for a discussion with seventh grade students next week. The students are reading Dowell’s novel as a companion to their history class discussion of the late 1960s and Vietnam. What I’ve been thinking about is that Dowell’s novel is not so much about Vietnam as it is about complexity. While the war in Vietnam is at the book’s center, what Jamie, the main character, is beginning to understand is that nothing is as simple as it seemed when she was younger. Jamie is twelve, and true to her age, she says right up front: “I was six months away from turning thirteen and I thought I knew everything.” What she “knows” is that war is glorious, and if she could she would enlist herself. The premise of the book is that Jamie’s older brother, T.J., is in Vietnam, and he send rolls of undeveloped film home to Jamie. Following an interesting passage where Jamie (and the reader) learns how film is developed in a dark room, she begins looking at T.J.’s pictures. Of course, Jamie’s idea of war is challenged by the realistic pictures her brother has taken. The story unfolds as you might expect. Slowly, Jamie understands that while war may be necessary, it is not what she had imagined. In my view, there are two things that make this book work so effectively. One is that Dowell herself was an “army brat.” She understands what she’s writing about and knows the answers are not simple. 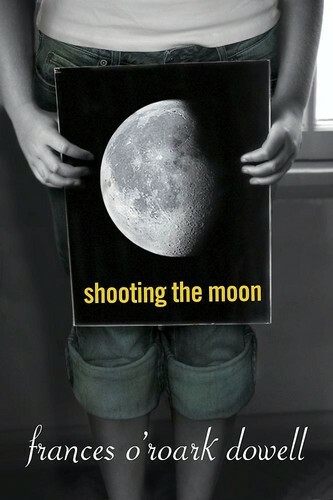 The other thing I like is that Shooting the Moon introduces “grey” in an age-appropriate and compelling way. From my experience, 12-year-olds are just beginning to transition from black and white to shades of grey. They are often still looking for who is “good” and who is “bad.” If only things were that simple. But Dowell gently leads the reader to an undertanding of more complexity. In one way, the book reminds me of Because of Winn-Dixie by Kate DiCamillo. That book is not resolved easily either. For many children, understanding that India’s mother is not returning home to India and her father is the first time they have encountered a book without a traditionally “happy” ending. What India learns in DiCamillo’s book is that we can’t always have everything we wish for. It’s the same for Jamie. She has an idea of what her brother’s experience in Vietnam will be, but as she matures, she sees that nothing is really that simple. As a teacher and librarian, I am often asked for book suggestions. Recently, a parent of a 6th grade student asked me for a top 10 of sorts—a list of books that most kids should read at some point.